At the height of the breeding season, there is said to be more wildlife here per square foot than any other place on the planet. South Georgia’s prodigious wildlife includes penguins, birds, whales and seals, and the numbers are absolutely staggering. 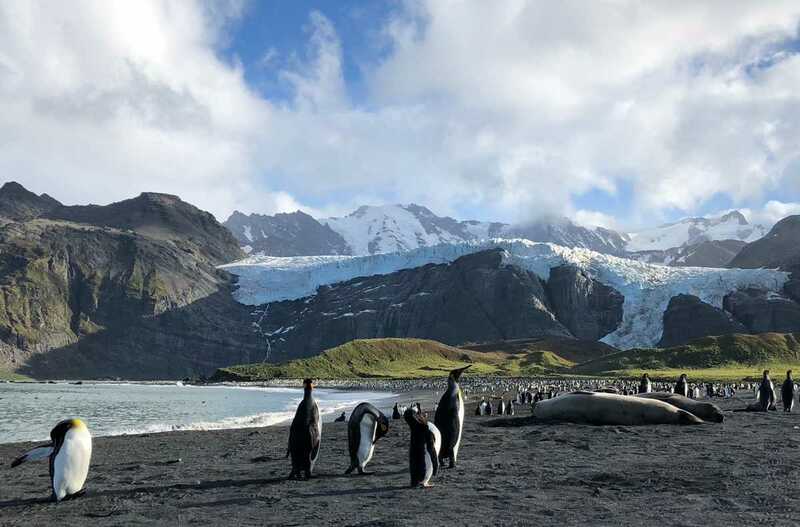 Their lack of fear of humans also makes them incredibly curious, this is one of the best places in the world to be approached by an inquisitive penguin, or lolloping seal. 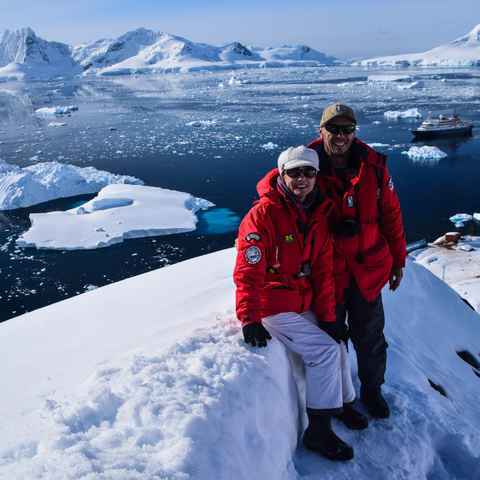 The diversity of landing sites on this small island make it one of the more spectacular places to visit in Antarctica. 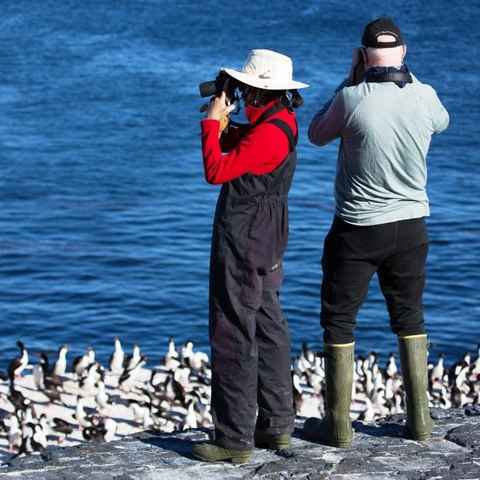 From a colony of 300,000 king penguins at St Andrews Bay, to Gold Harbour where the sun's rays bathe hanging glaciers in to make them glow in yellows and oranges, the scale of opportunities for wildlife spotting and taking in the scenery is unmatched. This is also one of the richest places for history - the sleepy village of Grytviken protects the grave of Sir Ernest Shackleton, and you can even hike in the man himself's footsteps on the Shackleton Walk, from Fortuna Bay to Stromness where he raised the alarm in 1916. On South Georgia we sometimes had a real challenge to find a safe landing place for the zodiacs because the beach was so packed with elephant and fur seals. The quantity of animals is staggering. Calibre of staff: If top-notch guides are important to you, there are significant variations between ships in the calibre and staff-to-passenger ratio. Functional vessels with heaps of character, trips aboard these ships feel truly expeditionary. Here, it is all about the quality of the landings, and expertise of the brilliant expedition leaders. Daily landings and adventurous activities abound, but with the option of coming back to a more luxurious cabin, or your own private balcony. The ultimate Antarctic cruises. Bright, spacious cabins, exquisite food, and the highest standard of service throughout. For a more intimate understanding of South Georgia's wealth of landing sites, these trips take the time to thoroughly explore the island. South Georgia is really special. The fact that we missed it on our first Antarctic trip is the major reason we went back. South Georgia was simply amazing and quite overwhelming in its abundance of wildlife and history. To have king penguins filled with curiosity and pecking on our boots was unexpected and something we’ll never forget. The highlights were the Shackleton history and being able to stand on the top of the pass where the trio looked down on the whaling base at Stromness - their destination. The king penguins on Salisbury Plain were something I've never experienced before - unbelievable; the wildlife was fantastic. South Georgia was a delightful surprise – far more to offer than I could have imagined. I knew about the whaling industry & Shackleton but was thrilled with the number of kayak outings & landings we made here. The old whaling stations were particularly overwhelming & emotional. Too many highlights to pick out one in particular, but South Georgia is a must do. Landscapes were simply awesome. The wildlife was much more plentiful than I imagined, also unafraid and curious. If you don't visit South Georgia you're missing the 'jewel in the crown'. When we did this trip in 2008 the expedition leader in her opening remarks described South Georgia as "the place where God goes for his holidays". We would definitely recommend including South Georgia and the Falklands - whilst we weren't quite prepared for the days at sea to get between these places, they ended up being a wonderfully restorative part of our holiday. South Georgia was the highlight of the trip. Be sure to choose an itinerary that includes it and you won't regret it. Salisbury Plain and St Andrews were amazing. I also loved Deception Island - I would recommend doing the polar plunge. How long can I spend in South Georgia? This will very much depend on which voyage you choose, most voyages spend between 3- 5 days exploring South Georgia, while the maximum is 8 days. A crucial question for photographers in particular. As ship’s don’t suffer from the same weight limitations as airlines, there are no restrictions once on board the vessel. However, you need to check weight limits on the domestic flights, which are typically only 15-20kg for hold luggage. Can my food requirements be catered? The answer is ‘Yes’. The kitchens on all ships are very experienced at catering for all food requirements, whether you are vegetarian, gluten free, lactose intolerant, or just prefer to avoid certain foods. The short answer is as soon as possible. There are far fewer of these longer voyages than the regular trip to the Antarctic Peninsula only. Because they're so spectacular, they're also in very high demand. To be confident of securing your preferred choice you should start planning as early as possible, and then ideally booking 12 - 18 months in advance. Early booking discounts are sometimes available. Voyage dates are typically released by the different boat operators between 15 - 20 months in advance. How much does a cruise to South Georgia cost? Prices start from around $8,500 per person, but vary markedly depending on the trip, ship, timing of travel and cabin category you choose. While discounts are rare, those people booking early can take advantage of early booking incentives of up to USD $1,500 per person offered on select trips. It's a substantial investment, but in well over a decade of helping people experience South Georgia, nobody has ever been remotely disappointed.